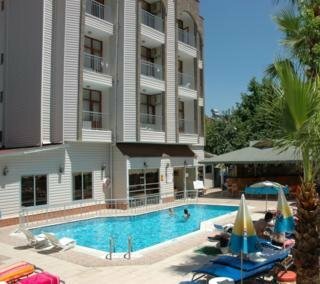 Enjoy a sun filled holiday in Icmeler by booking at the comfortable and friendly Ercanhan Hotel. 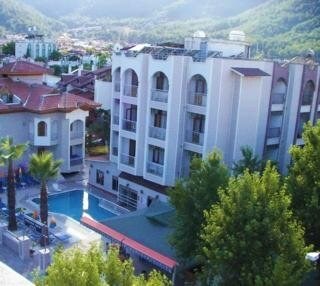 The Ercanhan Hotel is located in the popular summer resort of Icmeler on the coast of Turkey. 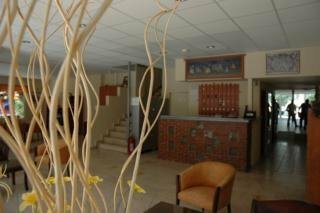 This is a great hotel for couples and families with a wide range of shops and restaurants only 50 m from the hotel and 34 attractive rooms surrounded by lovely gardens and overlooking a sparking swimming pool. Guests to the Ercanhan Hotel can discover marvellous beaches, explore the delightful villages nearby and experience real Turkish hospitality. For an affordable holiday in Icmeler, the Ercanhan Hotel is a perfect choice! Local Tips: Icmeler was originally thought of as part of Marmaris but has now developed its own identity. After dark there are a good selection of restaurants, bars and discos. The facilities at the self-catering Ercanhan Hotel are of the highest standard with excellently maintained gardens and accommodation offering everything you need for a relaxing holiday. 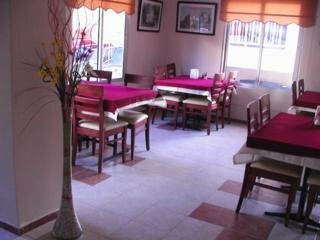 Food, drink and entertainment: Lobby restaurant with buffet breakfast, a la carte restaurant, snack bar, 2 bars, Turkish Nights, Karaoke, and Sky TV with Premier League Soccer. Sports, games and activities: Sparkling swimming pool, childrens pool, sun beds, umbrellas, garden, table tennis, billiards, reading room and electronic darts. Additional: 24-hour reception, currency exchange, safe deposit box (with charge), Internet access, room service, wheelchair access and parking. The Ercanhan Hotel features 34 air conditioned, attractive rooms with private bathrooms, telephone, Satellite TV, hair dryer, and private terrace or balcony with garden or pool view. We arrived about 2.30 am to be met by a great host and his partner, checked us in then opened the bar for us to refresh our selves, which was very welcome, the got us some chicken kebabs at about 4. 30 very tasesty. The hospitality went on from there for the next week nothing was a problem day or night. Not the best facility's but more than adaquite. A good time was had by all, maybe going back in sept all been well.